Ocean Breeze West, the affordable condo directly on the gulf, is perfect for those who enjoy small complexes. The building has 47 units with a Gulf front swimming pool and a large sun deck. 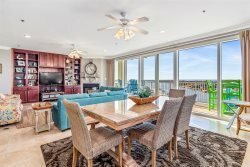 This condo has 1338 SF of living area and Gulf Front balcony access from the Living Room and Master Bedroom. Ceramic tile throughout unit. Electronics include 40" HDTV, DVD in Living Room, 32" TV in Master Bedroom, 20" TV in Guest Bedroom 1 and 19" TV in Guest Bedroom 2. Planning a summer vacation can be a challenge and ensuring it goes smoothly even more challenging. The staff at Perdido Realty have always made making plans and then enjoying those plans much easier. I have been using Perdido Realty for our summer vacation plans to the Florida Pan Handle for many years and enjoy the opportunity to work with them to fulfill our family vacation dreams! I have been bringing my family to Perdido Key for over 15 years. We travel 22 hours to get there and every year it is a highlight of our summer vacations. We love staying at Ocean Breeze West and the folks at Perdido Realty are awesome to work with. Ocean Breeze West and the Perdido Key area have been a treasure for my family. See you next year! No issues everyone is great! We have been staying,with u guys for years. We love this area! When we mention about staying somewhere different, our children want the same condo, #501 Ocean Breeze West. It feels like "home" when we get to come to the beach. We have referred many of our friends from Conway, AR as well. Thank you! Your staff was super friendly! Everyone was helpful, kind, and hospitable. Could not have asked for better treatment. Overall, our stay was comfortable and enjoyable. I loved the view! And, if you love privacy and an almost private beach, you could not ask for a better place to stay!